Star by Julien Macdonald purple and white strappy dress, UK size 10. Strappy handkerchief hem strappy dress in a purple and white print that ties at the back. Beautiful black chiffon 100% silk, fully lined evening dress. One shoulder with thin appliqué strap. Appliqués strap and down front to waist and over the shoulder to the back. Very elegant with fitted top and floaty very feminine skirt. Skirt has a split to left side to just over . knee to thigh. Featured floaty hemline. Size 10. 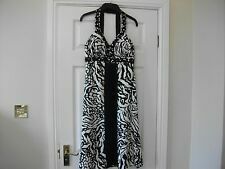 JULIEN MACDONALD BLACK /WHITE PATTERNED DRESS SIZE 8. Zebra print silky fabric. Ideal for wedding, races, party. This dress has only been worn once and is in excellent condition. Pleated black detail to the centre front. This blouse is a mixture of cotton and silk. it has silk sleeve and silk at the front with three button. The blouse is faded but still in a wearable condition. PLEATED TO TOP WITH BEADED & JEWEL TRIM TO CENTRE TO BUST. CAP SLEEVES. HAND WASHABLE. This is a gorgeous pretty black/orange/pink/white/green peplum beaded evening dress from Julien MacDonald STAR in size 12. Bust: 38", waist: 32". In very good condition. There are 2 front side pockets, is fully lined and there is a long side zip. JULIEN MACDONALD LADIES BLACK LACE DRESS SIZE 10. Ideal for wedding, races, xmas party, formal parties. Gorgeous stretchy fitted dress with lace panel detail to both front and back. 67% cotton, 33% nylon machine washable. Black Dress Star By Julien Macdonald Size 16 Worn Once. Lovely cowl neck with a draped side. It slips over your head to wear and has a lovely soft stretch. Very elegant.Condition is Used. Dispatched with Royal Mail 2nd Class. Black Pink And Orange star By Julian MacDonald. Dress can be worn off the shoulders and on I believe. Bo ug ht b ut n ev er w or n.
Bust: 34", waist: 28". Immaculate - new. It is fully lined and there is a long back zip. Beautiful beading work at the side. There is also a small back kick split. New listingStar by Julian Macdonald Print Beaded A-line dress size 14. B ut it sadly didn’t fit. f itted at bust with a tie at the back. F ully lined. Mock wrap dress. Colour Gold. Rich gold sheen. Item's color in pictures can slightly differ from original color. designer dresses size 14 Star By Julien Macdonald. Condition is New with tags. Dispatched with Royal Mail 2nd Class. Designer Two Piece Suit STAR by Julien Macdonald. Jacket has Free-fall Drape front. Beige backing with layers or black Floral Lace Covering. dress Zipped down Back. 33" Shoulder to base of dress. 20" top to base of jacket. BNWT Star by Julian Macdonald maxi dress in golds, bronze and cream colours with jewelled and crystal neckline and shoulder straps. Stunning dress for any dressy occasion. Dress is lined and lovely and flowy. Only defect is 3" above hem at front when there are marks and holes, as if got caught under wheels of a trolley - see last photo. Left it too late to return as did not see it. One other snag at back. Not very obvious because of pattern and also dress could be shortened to cut this part off. Price reflects this. Lovely dress otherwise with no other defects. New dress with neckleces(can be removed). Patterned midi dress by Julien Macdonald. Perfect condition- size 14. Bought for around £50. Dress by star by Julien macdonald. 19" from underarm to underarm. Stunning Star by Julien Macdonald Debenhams Dress. Light pink dress with decorated bodice and net skirt. Approx 32 1/2" from shoulder to hem. Star by julien macdonald dress size 12. Used. Dispatched with Royal Mail 2nd Class. STAR by Julien MacDonald size 8. 3/4 sleeved fine knit dress with deep V neck. Pulls on over head no zip, button detail at waist. A gorgeous women's dress by Star by julien MacDonald in a size 10. Made in a Smooth fabric in a black and white design print. Two large pockets on the skirt area give it that casual apeal. There's a lovely large beaded design around the neck line. The ties at the back and the sleeves have a lovely floaty appeal. Very good condition and hand wash. Fully lined for a slimming and flattering fit with long back zip. Stunning Star Dress in deep blues / purples. Cerise pink, chiffon, special occasion cocktail dress. Lovely waterfall sleeves with cold shoulder detail. 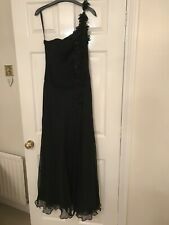 Beautiful, silk like dress from Debenhams by Julien Macdonald (Star), size 10. So soft and silky but actually made of Polyester and Elastane. Unusual pattern with Black, Green, Yellow and White swirls, flowers, spots and lines. Stunning dress by Julien MacDonald. This has a V neck and back. It flares from under the bust into a swishy midi dress with a hint of the 50s. It has a ribbon trim under the bust, studded with jade green beads. Armpit to armpit 16 ”. Length 36 ”. Waist 15 ”. Pit to pit 40 cm/15.5". No fastening. shoulder to hem 109.5 cm/43". Star By Julien Macdonald Beige Black Animal Print Knee Length Belted Faux Wrap Dress Size 14 Fully lined 100% polyester Measures approx . length 40" .chest 38" Good Clean Condition and comes from a smoke and pet free home Dispatched with Royal Mail 1st Class. Condition is Used, worn once. STAR by Julien Macdonald, Size 8 Champagne Floor Length dress. Condition is Used- only worn once. In excellent condition-like new. Very flattering fit. Dispatched with Royal Mail 2nd Class. Beautiful Star by Julien Macdonald Dress size 18 . Worn once. Condition is Used. Dispatched with Royal Mail 2nd Class. Lovely dress, worn once in great condition.